Ratana-Pon Pagoda near Mrauk U in Rakhine State. Destination Myanmar, a country in Southeast Asia, bordering the Andaman Sea and the Bay of Bengal south. It is bordered in north and northeast by China, in east by Laos and Thailand, in west by Bangladesh and the Indian states of Nagaland, Manipur and Mizoram. 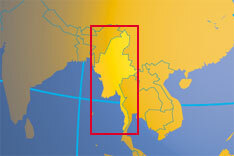 The country is also known as Burma and called the Golden Land. The country covers an area of 676,578 km², making it almost twice the size of Germany or slightly smaller than the U.S. state of Texas. Probably the highest elevation in both Myanmar and Southeast Asia's is Mount Hkakabo Razi (Khaka Borazi) at 5,881 m (19,295 ft) located in Kachin state near the country's northern border with China, about 110 km (70 mi) north of Putao. 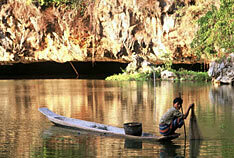 Burma's main rivers are the Chindwin (the 'Mighty Chindwin') and the Irrawaddy (Ayeyarwady). Myanmar has a population of 51.4 million people (2014 census). 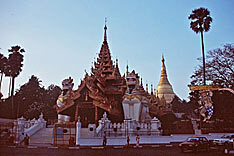 Largest city, former capital, and the economic center of Myanmar is Yangon. Since 2005 Burma's new capital is Naypyidaw, a planned city in central. Spoken languages are Burmese (official). Kachin, Kayah, Karen, Chin, Mon, Rakhine, and Shan are regional languages. Rohingya, the language of the Rohingya people from Rakhine State is spoken by about 1.3 million. According to the United Nations, the Rohingya are one of the most persecuted minorities in the world. In 2017 hundreds of thousands Rohingya fled from western Myanmar into neighboring Bangladesh because of the repression and violence they face in Myanmar. Type: nominally civilian government (since 29th March 2011, when Burma's military handed over power). The new political system came into effect after an election in November 2010. Constitution: 3 January 1974 (suspended since 18 September 1988 when latest junta took power). The country's third and current constitution was published in September 2008. Burma has been under military authority since 1962. Location: Southeast Asia, bordering the Andaman Sea and the Bay of Bengal. Area: 676,578 km² (261,228 square miles). Terrain: A land of hills and valleys rimmed in the north, east and west by mountain ranges forming a giant horseshoe. Enclosed within the mountaion barriers are the flat lands of Ayeyarwaddy, Chindwin and Sittaung River valleys where most of the country's agricultural land and population are concentrated. Climate: Tropical monsoon; cloudy, rainy, hot, humid summers (southwest monsoon, June to September); less cloudy, scant rainfall, mild temperatures, lower humidity during winter (northeast monsoon, December to April). Ethnic groups: according to Myanmar's Ministry of Foreign Affairs there are 8 Major National Ethnic Races in Myanmar, which all comprises different ethnic groups: the Kachin, the Kayah, the Kayin, the Chin , the Mon, the Bamar, the Rakhine, and the Shan. according to the CIA World Factbook the ethnic groups are: Burman 68%, Shan 9%, Karen 7%, Arakanese 4%, Chinese 3%, Mon 2%, Indian 2%, other 5%. Religions: Buddhism (89.2%), Christianity (5.0%), Islam (3.8%), Hinduism (0.5%), Spiritualism (1.2%) and others (0.2%). Languages: Burmese; Myanmar is a union of 135 ethnic groups with their own languages and dialects. Natural resources: Timber, tin, antimony, zinc, copper, tungsten, lead, coal, limestone, precious stones like jade, ruby and sapphires, natural gas, hydropower, and some petroleum. Agriculture Products: Rice, pulses, beans, sesame, groundnuts, sugarcane, hardwood, fish and fish products. Industries: Agricultural processing; knit and woven apparel; wood and wood products; copper, tin, tungsten, iron; construction materials; pharmaceuticals; fertilizer; cement. Previously an independent kingdom, Burma was annexed by the British Empire into the colony of India in 1886. The occupation brought social, economic, cultural and administrative changes to the once-feudal society. The Japanese Empire invaded and occupied the country during World War II but it was returned to British control until independence in 1948. From 1962 to 2011, the country was ruled by a military junta with absolute power. The name of the country was changed in 1989 by the ruling military government, officially recognized by the United Nations. Some national governments, such as Canada, the United Kingdom, the United States, and much of the Burmese population do not recognize this name change, since they do not recognize the military government. Despite multiparty elections in 1990 that resulted in the main opposition party winning a decisive victory, the military junta refused to hand over power. Key opposition leader and Nobel Peace Prize recipient AUNG San Suu Kyi, has been set under house arrest from 1989 to 1995, and was again placed under house detention in September 2000; her supporters were routinely harassed or jailed. In 2011 the military junta was dissolved following a general election in 2010 and a civilian government has been installed. Since April 2016 Aung San Suu Kyi, Leader of the National League for Democracy of Myanmar, is the incumbent State Counsellor and she plays an important role in government, but her influence is rather weak. 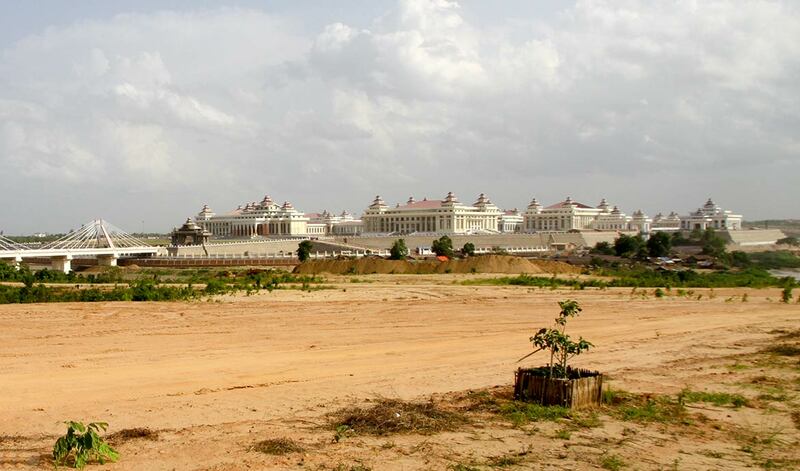 Parliament buildings in Myanmars capital Naypyidaw. Since 29th March 2011, when Burma's military handed over power, the country is ruled by a nominally civilian government. But the military retains considerable amount of power in government and parliament. In 2008 the country adopted a new constitution, but some critics say it is 'less a charter for democracy than the generals' retirement plan' . In March 2016 the first democratically elected government went into session after more than fifty years of brutal military rule. But Aung San Suu Kyi, trailblazer of the pro-democracy movement, was barred by the constitution from becoming president. Note: External links will open in a new browser window. Myanmar Official Government Home Page. Site of the ministry with information on Myanmar and its foreign relations. With information on Myanmar in English and Chinese. The embassy provides as well information on Myanmar. List of Myanmar missions in foreign countries. Address List of Foreign Embassies Addresses in Myanmar. Provider of official statistics of Myanmar. Administrative Map of Myanmar showing Myanmar and the surrounding countries with international borders, state/division boundaries, the administrative capital Naypidaw, state and division capitals, major cities, main roads, railroads and airports. Searchable map and satellite view of Myanmar. Searchable map and satellite view of Yangon. Searchable map and satellite view of Myanmar's second city, Mandalay. Searchable map and satellite view of Naypyidaw, Burma's new administrative capital. Searchable map/satellite view of the Golden Pagoda and other landmarks in Yangon. Map of the Southeast Asia region. Burma (Myanmar) related news in Burmese. DVB broadcasts twice a day Burma related current news and news commentaries. News Magazine covering Burma and Asia published by expatriates. 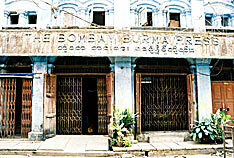 Specialising on Burma - related news and issues, especially India-Burma relations. An official daily newspaper from Myanmar. 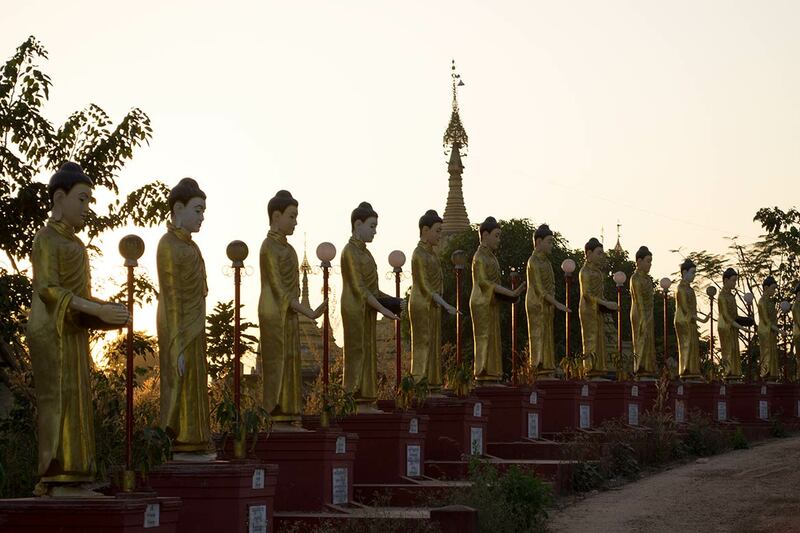 Sunset behind a line of Buddha statues in Bago (Pegu). Myanmar is a nation with a multiplicity of ethnic groups, more than130 distinct ethnic groups are recognized by the Burmese government. By far the largest group (68%) are the Bamar people who speak the Burmese language (a Sino-Tibetan language). Other main groups are Shan 9%, Kayin 7%, Rakhine 3.5%, Mon 2.0%, Kachin 1.25%, and Kayah 0.75%. Introduction to Myanmar's culture by Yangonow magazine. Also known as "Lawka Niti" for those who visits Myanmar or who is dealing with Myanmar people should observe certain rules. Burma Art gallery, a collection of Burmese art presented by Center for Burma Studies, Northern Illinois University. Aungsan, Burmese, Karen and Suukyi fonts available for Mac and PC. 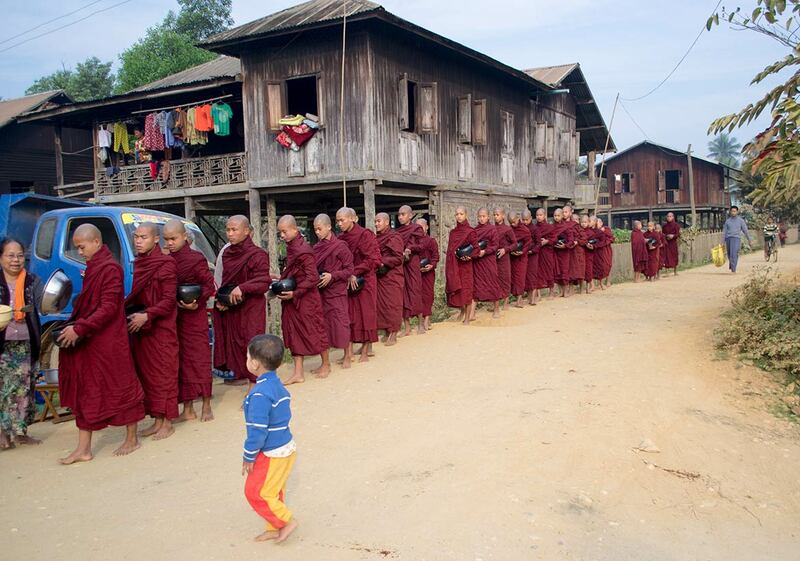 Burmese Buddhist monks getting alms. 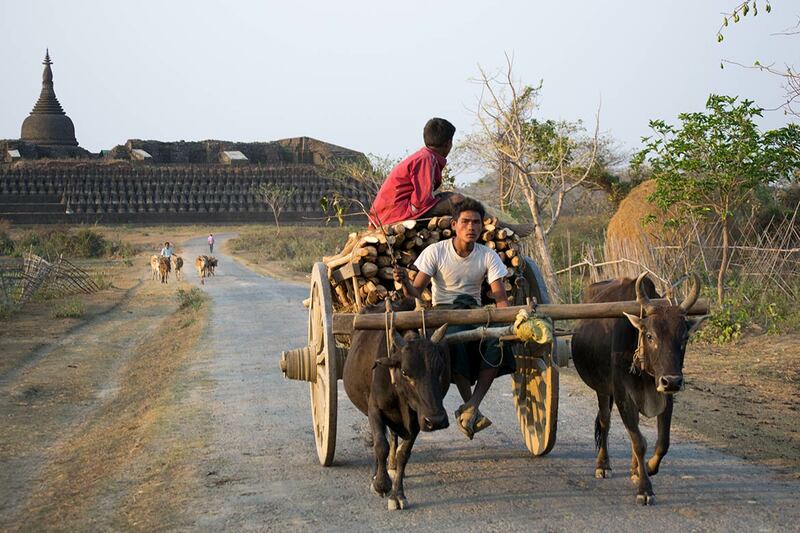 Wood transport with oxcart in Mrauk U, Rakhine state, Khoe Thaung temple in background. Since the transition to a civilian government in 2011, Burma has begun an economic overhaul aimed at attracting foreign investment and reintegrating into the global economy. The government’s commitment to reform, and the subsequent easing of most Western sanctions, has begun to pay dividends. Burma’s abundant natural resources, young labor force, and proximity to Asia’s dynamic economies have attracted foreign investment, actually more an invasion of foreign interests and badly needed money. Private airline based at Yangon International Airport. A domestic and regional carrier for the tourism sector. Offers international flights to Singapore and Bangkok. 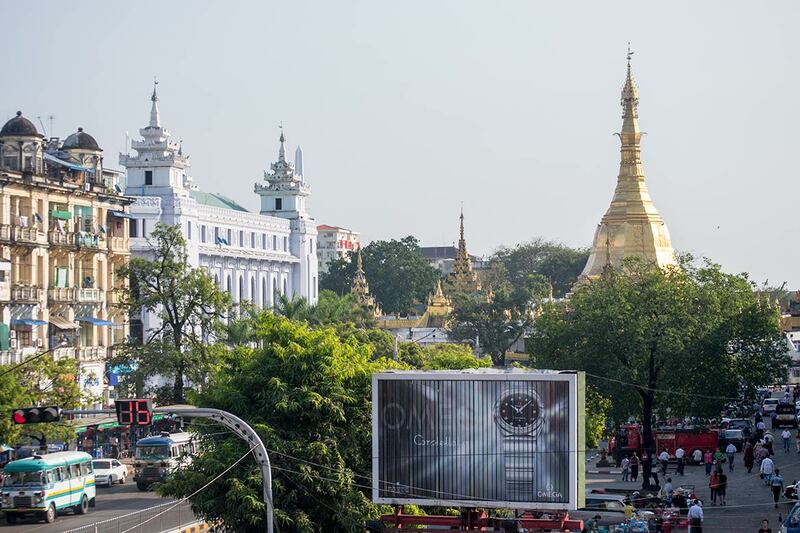 Yangon Sule road, with Sule pagoda (right) and Yangon City Hall (left). 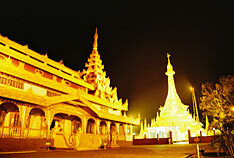 Yangon, a city that balances tradition, culture and modernity, is one of the world's most inspiring destinations, dubbed "The Garden City of the East", its impressive lakes, pagodas and colonial remnants have been pivotal in attracting visitors and investors to Myanmar’s main entrance and seaport. Official Tourism information on Myanmar. Myanmar site by the Ministry of Hotels and Tourism with many photo galleries. Comprehensive Myanmar travel information by Myanmar tourism promotion. A virtual journey through Burma. A comprehensive guide to Myanmar. Images of Myanmar's people and places by Valeska Gehrmann. 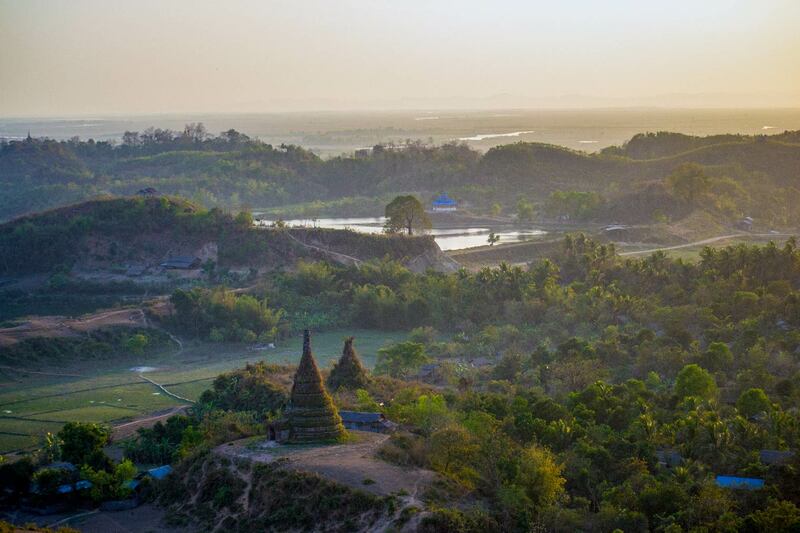 Landscape near Mrauk U in Rakhine State. MTU is the second senior engineering university in Myanmar, located in Patheingyi Township, Mandalay. UCSY offers both undergraduate and postgraduate degrees as well as diploma programs in computer studies. Oldest medical school in Myanmar. YTU was established in 1924 as the Department of Engineering under the University of Rangoon (Yangon). Myanmar related research papers and projects on the web. Information by World Wildlife Fund about this mountainous ecoregion of the southern portion of the Tenasserim Range, which separates Thailand and Myanmar. Documents on Burma's history at Online Burma Library. Myanma History by Myanmar Travel Information. 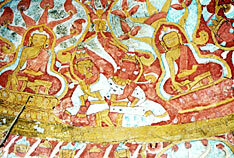 Timeline, Rulers, Heroes, Prehistoric Caves, Pondaung man, 4 million Pagodas by myanmars.net. Comprehensive background information on Burma/Myanmar with classified and annotated links to thousands of full text documents about Burma. Wikipedia articles about Myanmar's history. The Karens, pronounced (Ka-ran), are an indigenous people to the southeast Asian countries of Thailand and Myanmar. Article about the Karens' bitter war against the Burmese junta. The official home of Shan Democratic Union and Shan Human Rights. UNPO information on the Shan, Karenni, and Mon people of Burma. Amnesty International Report about Myanmar. The FAO Country Programming Framework Myanmar. Background briefings on human rights in Myanmar. Trade data and economic complexity indicators. Site provides an overview of its work to save children's lives, protect their health, provide them with educational opportunities and safe drinking water, and protect them from harm. Promote that every nation assumes responsibility for our world. Nations Online Project is made to improve cross-cultural understanding and global awareness.